Poetry and culinary magic unite at Pomegranate Café, an Ahwatukee restaurant that focuses on a new way of eating. By “utilizing fresh organic ingredients” to “tempt the palate and create wellbeing,” Pomegranate Café’s ever-expanding menu defies the idea that healthy foods must lack flavor. My experiences at Pomegranate Café have confirmed that health foods are true indulgences, delivering tastes of wondrous vibrancy in every bite. Pomegranate Café is owned by mother-and-daughter pair Cassie Tolman, a former Superstition Review intern, and her mother Marlene Tolman. Pomegranate Café has a diverse menu, full of wholesome vegan, gluten-free, and raw items. During my dinner there, I had a yummy potato-leek soup with a generous slice of gluten-free pomegranate-chocolate cake. I asked Cassie Tolman about how she conceptualized Pomegranate Café. I asked her if preparing a meal and writing poetry involve a similar process. A meal, she writes, “can be devoured”—perhaps like a poem. While poetry involves rhyme, meter, words, and sounds, the magic in food comes alive when “ordinary things—a bunch of beets, some garlic, a drop of oil, a handful of herbs—all begin to work together with elements like time and heat.” The work of a cook is similar to the work of a poet: the casting of ordinary objects into something that nourishes the soul. Cassie finds ingredients for nourishment in seasonal fruits and vegetables, supporting local farmers, and creates a beautiful meal. True to form, Pomegranate Café’s chocolate cake was the richest cake I’ve ever had. The pomegranate seeds that top the cake add a bright note of citrus and remind me just how deliciously smooth the cake is—even though it is completely egg and dairy free. Pomegranate Café truly values food. It’s evident that Cassie and her mother have worked hard to extract wholesome delights out of ordinary ingredients. In a culture of processed foods, where ingredient lists seem endless, the ingredients of Pomegranate’s meals are proudly simple. I am inspired by Cassie’s belief in the transformative power of food. 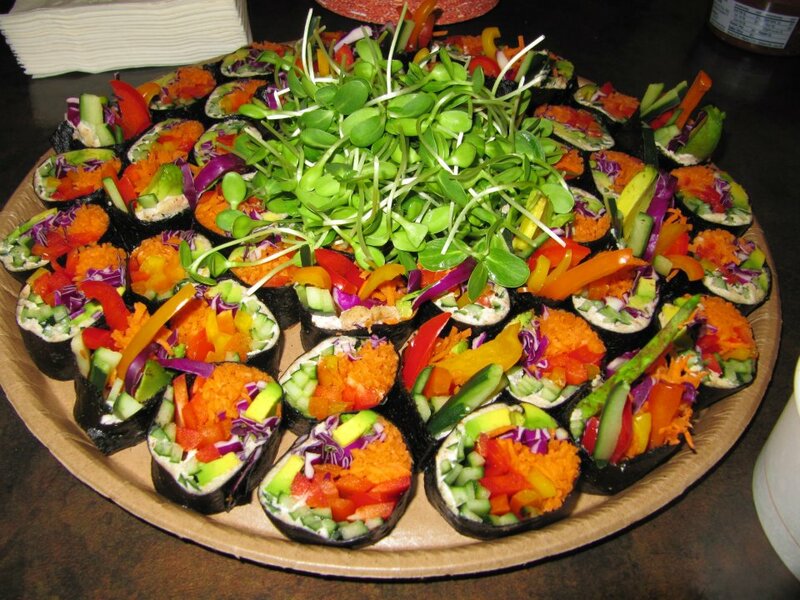 She loves to “create raw vegan dishes because the colors, textures, and flavors remain crisp, bold and beautiful.” I am so excited that she catered Superstition Review’s launch party. Cassie’s love of food is evidenced by Pomegranate Café. It inspires me to experiment in my own kitchen, testing different flavors and textures together—as I’d experiment with different sounds and words as a writer—to craft something delicious, wholesome, and nourishing. Cassie Tolman and her mother Marlene Tolman created Pomegranate Cafe as a space to combine flavor and nutrition in an earth-conscious manner. Opened in 2009, Pomegranate Cafe become a Phoenix hit. Cassie Tolman is a former Superstition Review intern and a graduate of The Natural Gourmet Cookery School. Her mother, Marlene, is a graduate of the Scottsdale Culinary Institute’s Cordon Bleu. You can find out more about Pomegranate Cafe on their website or on their Facebook page. This interview was conducted by current intern Christine Truong. Superstition Review: What inspired you and your mom to open Pomegranate Cafe? Cassie Tolman: My mom and I were inspired to open Pomegranate Cafe because we wanted to do something creative and authentic. We also wanted to get to know and nurture our local community. We are both passionate about healthy, organic vegetarian food and recognized that there were not many places in the neighborhood that serve fresh, wholesome food and drinks. My mom had some money that was passed on to her by her grandfather, and she decided that with the instability of the economy, investing in this dream was just as sensible as putting her money into retirement savings or any other investments. My 90-year-old grandmother (we call her the original health nut) also invested in Pomegranate Cafe. Two and a half years ago, we both quit our jobs, took a risk and opened Pomegranate Cafe in Ahwatukee. SR: How has your interest in poetry and literature translated over to the conceptualizing of the restaurant? CT: My interest in poetry and literature helped me conceptualize Pomegranate Cafe by supporting the idea that ordinary, everyday work can lead to magic. Opening Pomegranate Cafe has been transformative. Through lots of hard work and practice, what was once an empty, abandoned wine bar in a strip mall is now a bustling, thriving, vibrant cafe! SR: What are some of your favorite dishes to prepare and why do you prepare them? CT: I do not have a single favorite dish to prepare. Rather, I prefer to experiment and almost never cook the same thing twice. My favorite way of preparing a meal is to start with fresh, seasonal, local ingredients. From here I am inspired by the people I am cooking for and the ingredients I have in my kitchen. 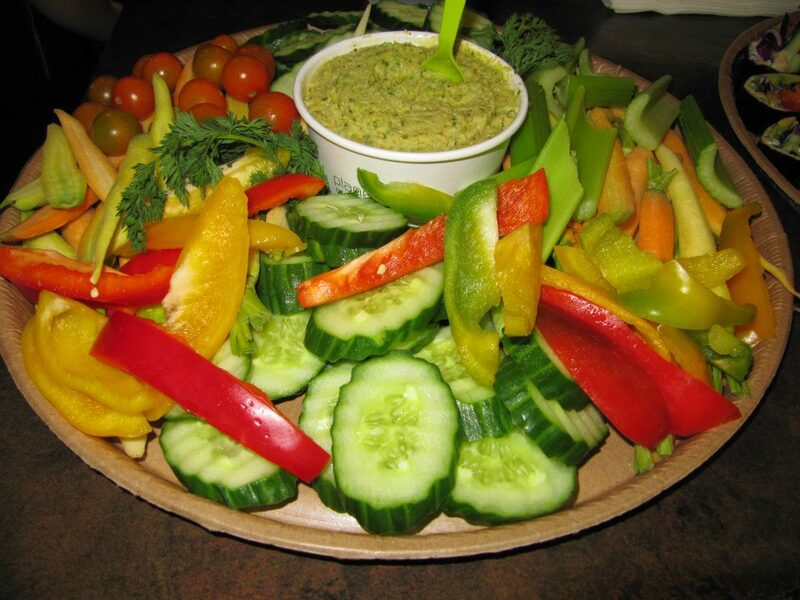 I love to create raw vegan dishes because the colors, textures and flavors remain crisp, bold and beautiful. SR: Do you think that preparing food and writing poetry involve, in some ways, a similar process? CT: Preparing a meal and writing poetry do involve similar processes. The cook and the poet are both resourceful. We use what we have on hand, what happens to be in the cupboard or fresh from the garden today. With our hands, practiced technique, a few tools and a little magic, we create a meal (or a poem) that can be devoured. The magic comes into play when ordinary things – a bunch of beets, some garlic, a drop of oil, a handful of herbs / a single image, a memory, a string of words – all begin to work together with elements like time and heat. And somewhere in the process of hand and cutting board, stove and knife, pencil and paper, washing, chopping and mixing – a transformation occurs. The ingredients that were there in the cupboards, or the words that were under your pillow while you slept, are now coming together in the pot or on the page to form something new. Hopefully something to be eaten, savored, read, remembered. SR: What are some things you like to do in your spare time? Haley Coles is a junior English major with a Creative Writing concentration. Haley Coles: I am one of two poetry editors. I review submitted poetry for consideration in Superstition Review. At the beginning of the semester I created a list of 20 previously published poets from whom to solicit work from. It is my job to decide which poems, solicited and not, will be published in the journal. HC: I received an e-mail from one of the English advisors about the internship. For the past few years I have had a desire to work on a literary journal, and once the opportunity came I jumped on it! HC: I’d like to leave SR with two new awareness. The first is, as a poet, to understand how work is selected for publication in journals so I might be more conscious about how I format my own submitted work. With the huge amount of submissions I am reading as an editor, I have more empathy for editors of larger journals and know that the rejections sent are truly not about the poet as a person. Secondly, I hope that my experience with SR will qualify me for future work in other journals. And I suppose I have a third expectation: reading a TON of poetry!! HC: A Portrait of the Artist as a Young Man by James Joyce has been one of the most influential works I’ve read in my literary career. I read it for a British Literature class last semester, and it completely changed my artistic life. The book helped me to make the transformation from a woman who is good at writing and enjoys doing so to living my life as a committed poet. Though I don’t have much in common with early-twentieth century Irish Stephen Daedalus, I found myself enraptured by his complex yet persistent desire to freely create and live in his art. I have been truly inspired by his journey. HC: I just finished House of Leaves by Mark Z. Danielewski. I’m about to start on either Letters to a Young Poet by Rainer Maria Rilke or The Plague by Albert Camus. SR: Who would be the Superstition Review contributor of your dreams? HC: Sylvia Plath–nobody said they had to be alive! Sylvia Plath was the first poet whose work moved me, and as a result inspired me to be a poet. In almost every poem I write there is a nod to her extraordinary language. HC: I definitely prefer reading journals in print. There is something substantial and comforting about being able to hold a journal in my hands, to rest it on my chest while I lay on the couch, to circle passages that intrigue me, and to fold down pages to return to. HC: I write poetry. I am taking a forms class, so I’m consistently writing for that class. Right now, today, I am working on reading rather than writing. I just finished a poem that exhausted me and am giving it a week or so to come back to it for a revision. So until then, I am rebuilding my aesthetic by reading submissions coming into Superstition Review and various other literary journals, particularly MAR and Rattle. SR: Besides interning for Superstition Review, how do you spend your time? HC: I attend ASU full time. When I’m not in class or studying (which is a huge chunk of my life), I like to cook, read, play Risk, ride bikes, and make fun of my cats. HC: In 10 years I will be 30. By this time I will have my MFA in Poetry and could be working on or have already received my PhD. I will be teaching either high school Literature or college Poetry. I will have a part in a vegan community-oriented restaurant cooperative. I will be gardening and writing a lot and will have at least one book of poems published. I might be in Berlin or on the East Coast.